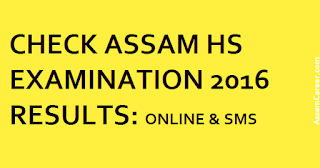 How to Check Assam Higher Secondary [HS] Examination 2016 Results ? 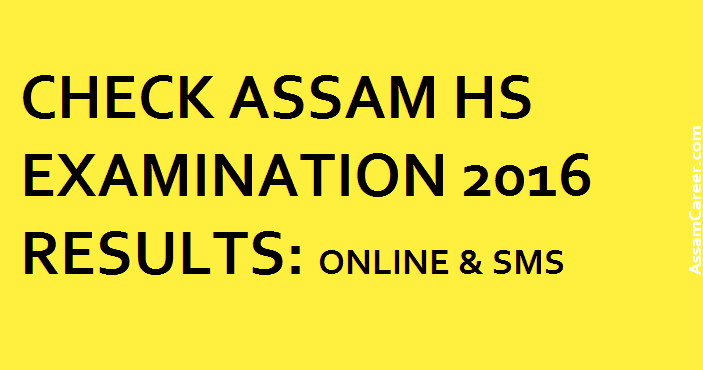 The results of Assam Higher Secondary [HS] Final Examination 2016 will be declared tomorrow on 2nd June 2016 at 10 AM by Assam Higher Secondary Education Council [AHSEC]. The results will also be available at examination centres and various schools. Also, candidates may check the results via various websites, SMS, and using USSD codes for various mobile operators. BSNL Users: BSNL users must send SMS to the number 57766 in the following format to get examination results. ASM16[space]ROLL[space]NO . AIRTEL Users: They must send SMS to the number 5207011 in the following format to get examination results. AS16A[space]ROLL NUMBER for Arts Stream, AS16S[space]ROLL NUMBER for Science Stream and AS16C[space]ROLL NUMBER for Commerce Stream . IDEA, VODAFONE, TATA, RELIANCE Users: They must send SMS to the number 58888111 in the following format to get examination results. AS16A[space]ROLL NUMBER for Arts Stream, AS16S[space]ROLL NUMBER for Science Stream and AS16C[space]ROLL NUMBER for Commerce Stream .